How does an artist respond to the horrors of war and the genocide of his or her people? Can art play a role in the fight for justice? These are key questions for understanding the work of Guatemalan photographer Daniel Herná ndez-Salazar. Since the 1980s, Herná ndez-Salazar has created both documentary and aesthetic works that confront the state-sponsored terrorism and mass killings of Guatemala's long civil war (1962-1996). His photographic polyptych (4-panel image) 'Clarification' became the icon for the Recovery of Historical Memory project of the Archbishopric of Guatemala, as well as a rallying symbol for Guatemalans. 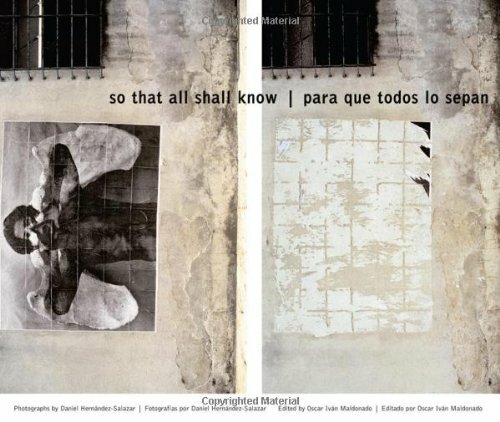 Broadening his crusade for justice in the twenty-first century, Herná ndez-Salazar is now also using the shouting angel of his polyptych (entitled 'So That All Shall Know') to challenge the forgetting and/or erasure of painful history in many parts of the world, including Mexico, Japan, the United States, Canada, and Argentina. So That All Shall Know is a powerful, comprehensive overview of the work of DanielHerná ndez-Salazar on recent Guatemalan history. Portfolios of images present his early photojournalistic work documenting the Guatemalan genocide; his Eros + Thanatos series that responds aesthetically to the destruction of war; and his Street Angel project, which uses his image 'So That All Shall Know' to protest against injustice and historical forgetting around the world. Accompanying the images are bilingual English-Spanish essays by four scholars who discuss the development of Herná ndez-Salazar's art in the context of contemporary photography, the social and political conditions that inspire his work, and the broader questions that arise when artists engage in social struggle. Introduced by Nobel Peace Laureate Rigoberta Menchú Tum, So That All Shall Know is a moving testament to the horrors of genocide and the power of art to give voice to the silenced and presence to the disappeared.